Did you know a sharp knife requires less effort to use than a blunt knife? That's why you need to know how to sharpen your kitchen knives the right way. It simply takes less force to cut something with a sharp knife than with a blunt knife. It's safer, too. 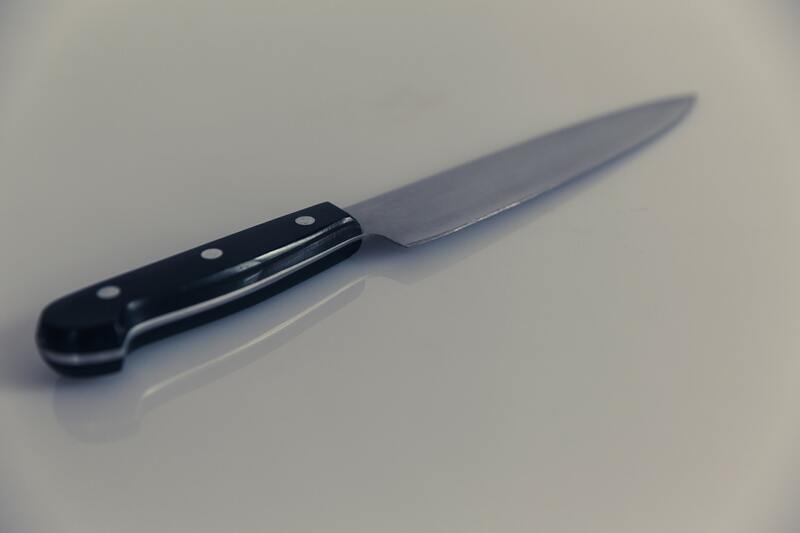 If you have a dull knife, you need to use more power which can result in dangerous situations where your knife can slip, accidentally cutting you or someone else. No one likes to struggle with cutting, chopping and mincing just to find that the knife has left you with jagged, uneven pieces of food that won't cook the same. Your presentation matters, even at home, because the first sense, other than smell, that a person “tastes” their food with is their eyes. If the food looks excellent, and cuts are clean and uniform, it usually tastes even better. You may have struggled to put a razor's edge on your favorite chef's knife, yet found your results to be poorer than you'd hoped. Or, you may just think that your knife set is terrible and needs replacement. Chances are, if they're sturdy, good quality blades, what you need is to know how to sharpen your kitchen knives the right way. And to give you another reason why it's so important to keep your knives sharp. Blunt knives often harbor bacteria and germs of all sorts, and you don't want that in your food. So, learn how to sharpen your kitchen knives and make your life in the kitchen a lot easier, and safer! But that's not all, let's dig in. So now we hope that we have convinced you to make sure your knives are sharp at all times. But we still need to stress the importance of sharpening your kitchen knives even more. We'll start it off by saying that sharpening your knives benefits your health, safety, productivity, and control. By now, it should be clear that knowing how to sharpen your kitchen knives will benefit your health and safety. But maybe your time — for example, productivity or efficiency — is more important to you. In that case, it's good to know that when your knife is sharp, you can cut your foods faster and hone your cooking (and cutting) skills more quickly too. 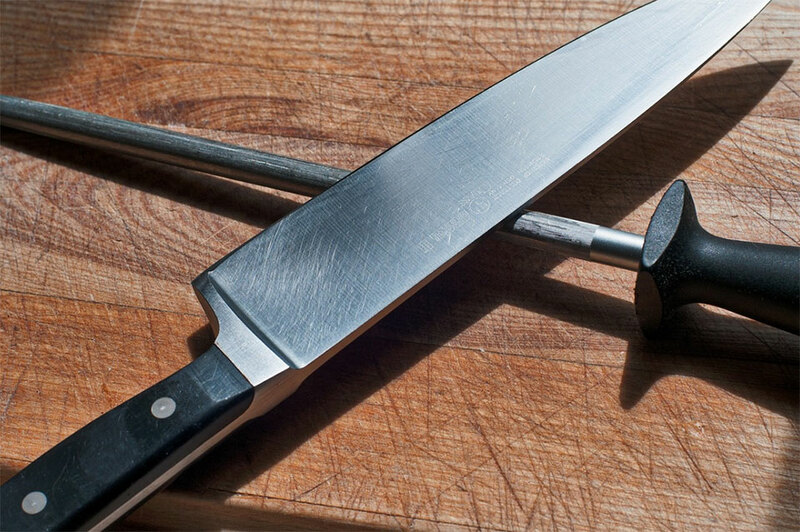 If you were a chef, would you teach your students to cut with a blunt knife or with a sharp knife? That's right, with a sharp knife because it will make it easier for them to learn. Also, by controlling the process of sharpening your kitchen knives, you are the one who decides how sharp they will get. And at which angle you will sharpen them. If you want to use a particular knife for chopping, you can sharpen the blade so that it has a wide 45-degree angle. However, to make sure you optimize your knife for slicing, you might want to sharpen your knife to a narrow 15-degree angle. Before you learn how to sharpen your kitchen knives, we'll need to set some boundaries and standards. First of all, every method you will use needs to sharpen your knives for real. People out there must have used the sharpening method to prove it works. Another requirement the methods below must fulfill is a guarantee of safety for you and others around you. You don't want to use any fancy tricks that are going to get you (or someone else) hurt badly. And last but not least, when it comes to learning how to sharpen your kitchen knives, you probably prefer to find out the cheapest and most efficient ways. That's why we've picked the 10 most efficient and cheapest ways to sharpen your kitchen knives. There are many ways to sharpen your kitchen knives, but we managed to get to know the 10 most popular ways. To find out how to sharpen your kitchen knives the best way, you can try every method listed below and pick the ones you like the most. If you don't fully understand how to use a particular technique, try to research it. If you still don't know how to perform the sharpening method properly, don't try it at all and pick another method instead. Probably the most common method to sharpen knives, before the fancy machines showed up, was the knife sharpening steel. It's the very same tool Gordon Ramsay uses to sharpen his knives. When someone like Gordon Ramsay uses this method, it's got to work, right? 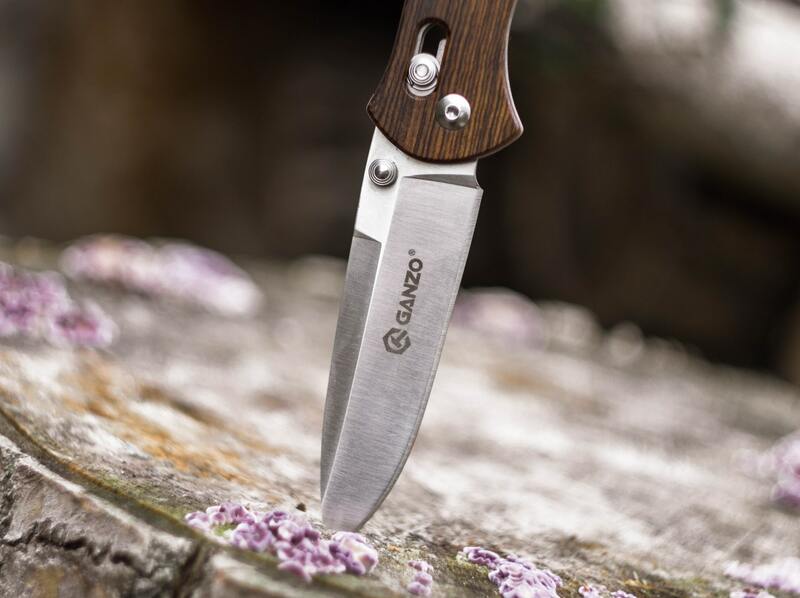 Although it's officially called a honing steel, Gordon still calls it a sharpening steel, so you can do it too. While using this tool will require a bit of elbow grease, the results are amazing. And the best thing about a honing steel is that it is relatively cheap. On Amazon, you can find a honing steel. With this sharpening method, you will have full control, including the control over your safety. When a knife is very dull, you're going to need a bit more than just a sharpening steel. That's where machines come in. You have to choose between a manual or electric sharpener. If you decide to use a manual knife sharpener, you'll have to follow the manufacturer's instructions very closely because every sharpener is different. Also, with many manuals, user error can cause some pretty serious problems achieving the edge you're after. Manual knife sharpeners are cheaper than electric ones. The best part is that you don't lose much control because you still have to do the moving. The downside, however, is that you can't fix any big issues such as notches. You'll need a more delicate tool for that, like the electric knife sharpener. Electric knife sharpeners are more for people who don't trust themselves with the fate of their kitchen knives. Your faith in an electric knife sharpener does come at a cost though. High-quality electric sharpeners are more expensive. However, you don't have to put in a lot of work anymore. The product's guidelines will tell you what to do with every knife, and you don't have to apply any hard pressure to sharpen your knives. Also, you don't need to learn how to sharpen your kitchen knives the hard way. Another downside besides the price is that you lose all your control. Sure, you're the one sticking your knife in the sharpener, but once it's doing its job, you don't know what's going to happen. A few wrong moves and your kitchen knives fly through the air. Well, okay, probably not. But to give you a tip: go slow and steady, pull it slowly through the machine while putting little to no pressure on it. The upside to that, you don't have enough control over the process to remove the edge from the blade you are trying to sharpen if you follow the instructions. That can happen when using a sharpener incorrectly, but it's easier to do with a manual. Learning how to sharpen your kitchen knives with a whetstone sharpening tool can be very tricky because it's very slippery. That's why it's important to put something beneath it that will give it some grip. Grab a towel or anything sturdy and put it under the stone before you start sharpening your knife. We can go back and forth on how to go about this, but chef Hiro is better at explaining it. However, one adjustment you could make is doing it with the sharp side away from yourself. 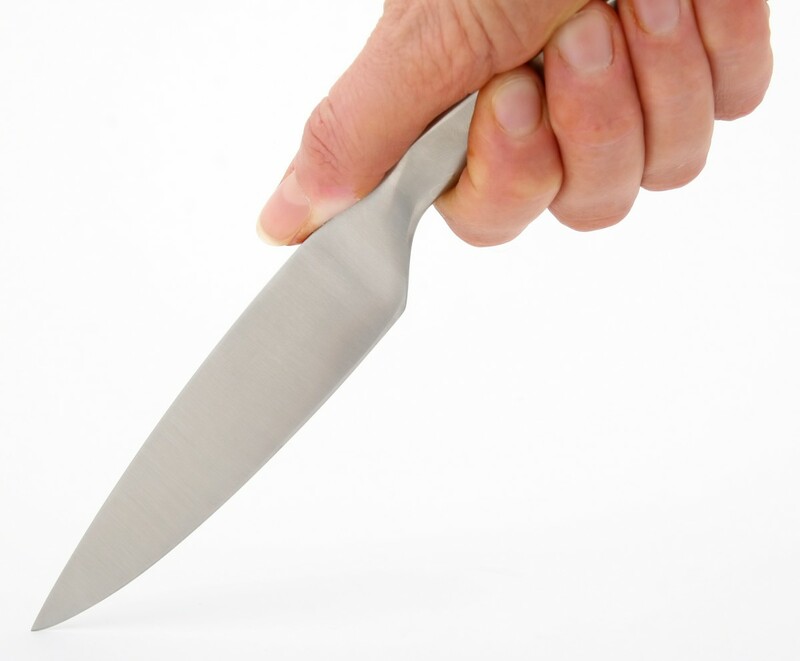 Sharpening a knife with the blade facing away will ensure extra safety in case your knife slips away. Some details that chef Hiro doesn't explain are that you should wet the stones for about 10 minutes before using them. The degree and exact range of motion you use is totally up to you but if you've never done it before we recommend you try doing it at a 20-degree angle while starting at the base and ending at the tip of the blade. 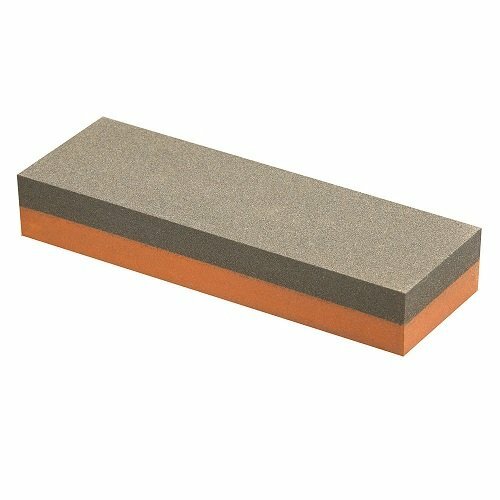 A great benefit of having these sharpening stones is that they can serve more than one purpose. You can sharpen scissors, scythes, razors, and even plane blades with it. So, it becomes a handy tool, even if you don't own an airplane. The Best Value We've Seen! 3 stones included. Durable, dry, and expensive. That's what makes the diamond stone different from the oil- and whetstone. While the diamond stone is of very high-quality, it's the most costly stone of all. You can get three diamond stones in Amazon. The best characteristic of the diamond stone is that you can use it while it's dry, which means less mess. That's worth it, right? Most people will recommend you use it wet though. When you decide to do that, use water instead of oil or any other lubricant. Make sure to check out the instructions of the stone before you do anything with it. Something pretty cool about the diamond sharpening stone is that it looks gorgeous. It's like having a real diamond in your hands. That's probably also the reason why the price is much higher than the other stones. Many people use “honing” and “sharpening” interchangeably. They are not, however, the same when it comes to your knives. While we've gone through a couple of ways to sharpen your kitchen knives, there's also the part where you hone your knives. 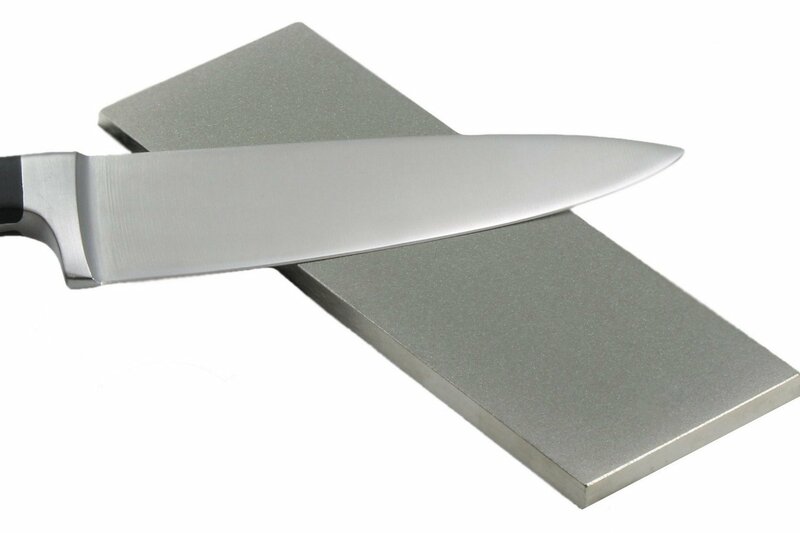 Using the honing steel, you can keep that razor edge in good shape with regular attention between sharpenings. While most people will call using that steel sharpening, it's actually honing. Honing refers to keeping the knives sharpened edge straight and sharp. You usually hone a knife just before you use it. 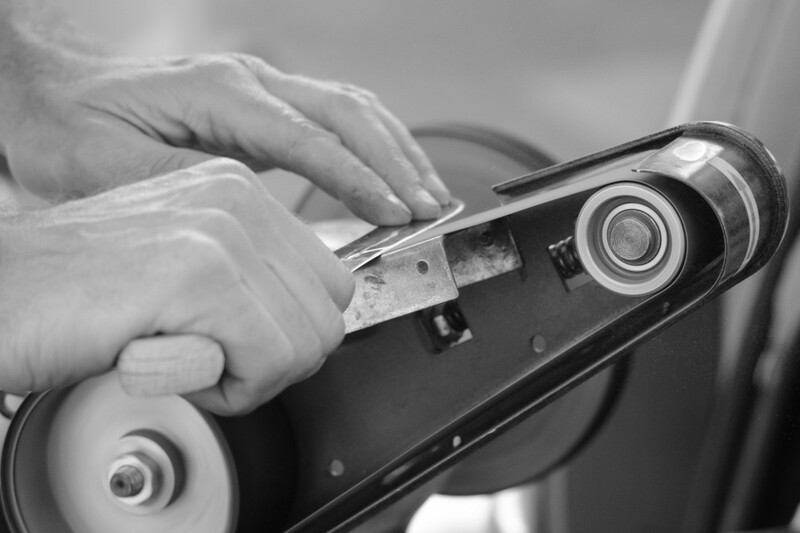 When sharpening, you create a new and sharper edge, which removes material from the blade. When honing, you are correcting any micro imperfections, waves or divots that may have occured during the last use of the blade. So, honing is actually just maintaining your blade's condition while trying to expand its lifespan. The downside of honing is that the tip can eventually curl up and you won't make it any sharper. While honing your blades regularly before use will help keep them in tip-top cutting shape, most blades will require sharpening eventually. Honing keeps your knives sharper longer. When it is time to sharpen your knife, make sure to hone it afterward. You can do it precisely as sharpening the knife with the steel, but you should do it only 4 to 5 times per side with a 22-degree angle (you don't have to be completely exact). Some knives need special attention and care. For these knives, you will need to use the method that best suits its shape. That's why we'll talk shortly about serrated and santoku knives. Serrated knives have specifically designed sharpeners, but most people with experience find them disappointing. They recommend using a manual sharpener so you can sharpen everything from scalloped to saw-toothed and pointed serrations. Santoku knives usually have a variety of angles on both sides which makes them quite tricky to sharpen. That's why we recommend you use the electric sharpener for this one. Manufacturer instructions will tell you to sharpen only one side. But you can put the other side through it one time, just as a finishing touch. A fun way to test if your knife is sharp is to cut through a newspaper but did you know you can also learn how to sharpen your kitchen knives with one? While this might not be the most effective way to do it, it's fun. The trick is to use the page with the most amount of black ink on it. That is because carbon is the reason why you can sharpen your knife with a newspaper. So, grab your newspaper and lay your knife flat on the paper. 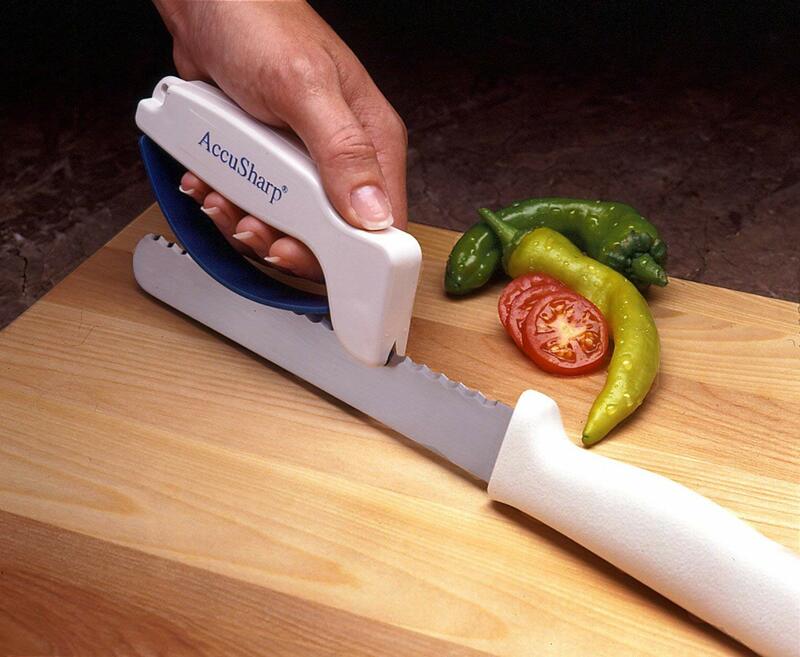 Now, stroke your knife across the paper slow and steady while keeping the knife straight. Wash off the graphite from your knife, dry it and test your sharpness. If you're not happy, go back and repeat the process. If you are not interested at all in learning how to sharpen your kitchen knives, you can hire a professional. Usually, it costs around $10 per knife to let a professional sharpen your kitchen knives. You don't have any unnecessary risks, you know it's going to be good, but you have to pay the price. Are you serious about your kitchen knives and do you want to treat them right? Then this is probably the best way to sharpen them. Keep them in top condition to maximize your safety, health, productivity, and control. In order to know how to sharpen your kitchen knives, you also need to know how to sharpen your tips. Or better yet, fix them to keep your blades sharp. The best way to do this is to use one of the stones. But instead of pulling your whole blade over the stone you merely put the tip on it while keeping your finger on the tip. Now run the tip horizontally across the stone to create a point. And after that, you round out the edge by rocking the tip back and forth like you're cutting something. To finish it off completely, sharpen the knife with the stone afterward. Now you have a beautifully self-made tip. A sharp tip is as important as a sharp blade because you will be able to cut smaller pieces faster and more delicately. Another benefit of a sharp tip is that you can open packages easier. Another critical factor in maintaining the sharpness of your knives is the storage of the knives. The worst idea is just throwing them into the drawer while the best approach is to invest in a universal knife block. 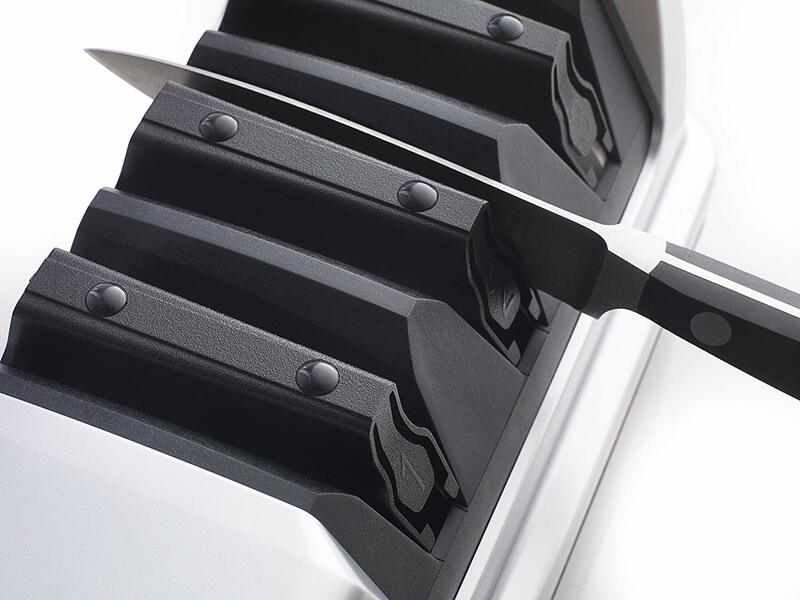 Other alternatives are knife guards or magnetic strips on which you can hang your knives. It may not seem like a big deal, but if you've ever cut yourself open by grabbing in the drawer only to feel a very sharp kitchen knife, you know why it's important. Safety is a significant factor when it comes to knives, so don't procrastinate on this one. A myth we need to bust first is that you can not over-sharpen your kitchen knives. This is probably a question you had in mind while learning how to sharpen your kitchen knives. You can oversharpen, eating into the blade edge. But no matter what people say about electric machines cutting off too much metal, using the right tools correctly, you don't have too much to worry about. This is also the same for honing steels. Make sure you use the best possible tools. Now that you know how to sharpen your kitchen knives, we'll give you a few handy tips to keep them sharp. First of all, never put your kitchen knives in the dishwasher. That's just a no-go. Gently scrub your blade with hot water and dish soap, treat them nicely. Another mistake people make is cutting on hard surfaces instead of using a cutting board. You may get away with doing it once or twice. But hard surfaces like glass or marble will speed up the dulling process. An easy way to test if your knife is sharp enough is by grabbing a paper and holding it in front of you with one hand. Now cut with the other hand (and the knife of course), slice through the paper from top to bottom. If it cuts easily, it's good. If not, sharpen it again. There's another reason why you should love to learn how to sharpen your kitchen knives. Sharp knives bring thin pieces of food. Thin slices of food taste better. So, get sharpening and taste the difference!